I’m becoming increasingly disenchanted with tasting notes that serve merely to list descriptors of a particular wine. Yes, we are trying to tell people what a wine tastes like (by ‘taste’, we mean both taste and smell, and their combination with other sensory inputs, of course). But beyond this, we are sharing a perceptual experience. Don’t let the word ‘perceptual’ put you off, though – I’m not about to launch into a tirade of half-baked amateur philosophy (I save this for other places on this site). What I mean is we are trying to share what is inside our heads when we taste wine. It’s a seamless experience that can’t easily be reduced to words. 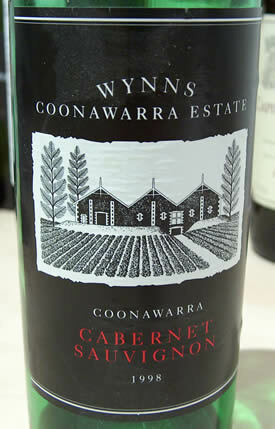 I’m drinking a Wynns 1998 Coonawarra Cabernet Sauvignon as I write. I have a ready for drinking rack, and this Wynns is one I put there a few weeks ago, not expecting much from it, although I have had good experiences with the 1991 and 1993 cellared for a decade each. But with wine, mood guides me a great deal, and I guess I’d lost enthusiasm for this particular bottle. This comes back to the rather vexed issue of choosing the right bottle to open on any particular night. I’m mood driven in my drinking, and despite having a reasonably large selection of wines stored at home I often find it really difficult to decide what to open, and when. It’s Monday night, and I’m working writing assorted bits and pieces up. It’s part work, part fun: I enjoy what I do quite a bit, and anticipating an evening with the laptop and some notes is quite a comforting thought. Normally, I’ll not open anything too special to accompany my work, especially on a Monday, but the Wynns is proving a very respectable drink indeed. Earlier on, putting one of my sons to bed I read him Goldilock and the Three Bears – his choice – and was struck by the comparative porridge tasting undertaken by Goldilock. Father Bear’s porridge was too salty, while Mother Bear’s was too sweet; it was only Baby Bear’s palate that matched Goldilock’s. It’s interesting that different taste preferences are such a common occurrence that they even make it into children’s fairy tales. The nature of individual differences in taste is one that fascinates me; I’ve just written an overlong piece on this for Harpers. I feel the wine trade has been slow to recognize this phenomenon, and a lot of confusion has resulted from the assumption that we are all sharing the same experience when we taste a bottle of wine. Back to the Wynns. The reason I’m enjoying this wine so much tonight is threefold. First, it out-performs my expectations. Each of us brings expectations to our wine drinking experience, and if these aren’t met because they are too high the wine can disappoint irrespective of its merits. Second, it shows typicity – or terroir, if you like. I can recognize it as a Coonawarra Cabernet, which brings me immense satisfaction. I’m getting blackcurrant fruit with a minerally, slightly chalky core. It’s savoury and quite well defined, with sweetness of fruit at one end of the flavour spectrum and slightly tarry, spicy, gravelly bite at the other. There’s quite a bit of mouth drying tannin, too. I’d spot this as Australian when tasted blind, but I hope that its restraint and minerality would put it firmly in Coonawarra for me. Third, it’s a wine that’s in balance. There isn’t too much of any one component, and specifically oak and alcohol which I find problematic in some new world reds. This isn’t a great wine, but it’s a pretty good one, and considering that it cost around £7 when I bought it, it’s a fine value. If you have some stashed away, then I’d recommend drinking it over the next decade: there’s no hurry to drink this up, and it’s just started drinking well. A score? A solid 90, if you ask me.